When Teaching Dad decided to go away for a whole week during the half-term holidays leaving me behind to look after our two children on my own, the first thing I thought was: I have got to clean the house. I tell a lie – but you knew that didn’t you? However, after a chaotic week of chasing the children around the house, arts and crafts, cooking, spilled drinks, marking endless assessments and even purchasing my wedding dress, the house was in need of a good clean. I wanted it to be sparkling for when Teaching Dad returned home. 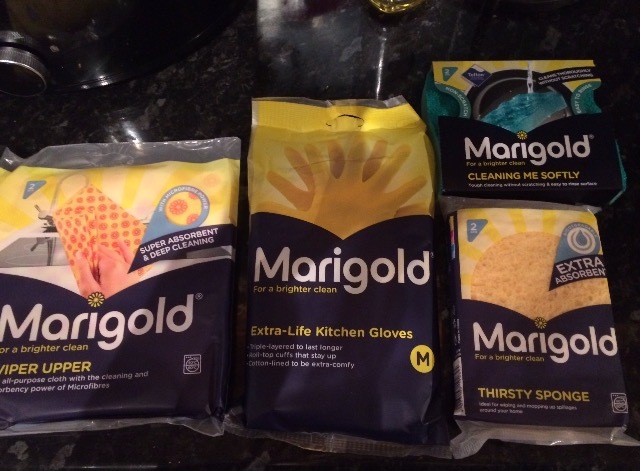 I was kindly gifted a number of cleaning products from Marigold who are celebrating their 70th birthday this year. Who knew that the iconic yellow rubber gloves were so old? The ‘Wiper Upper’ I used to clean the hob and kitchen sink. Like the Thirsty Sponge, it was good to soak up any excess water left over from the washing up and any grease left over from cooking fish fingers, chicken dippers and chips, which was the kids’ staple diet while Teaching Dad was away as he is the cook of the family. Teaching Dad arrived home from Austria to a sparkling home. Our children had been confined to the sofas to wait for him to come home. Five minutes after he walked through the door, the house was, once again, in a state of disarray because the ‘fun’ (some would say messy) parent was finally home. Nothing ever stays clean in our house for long, so it’s a good job that Marigold has got my back.